The ninth at Western is a 186 yard par 3. 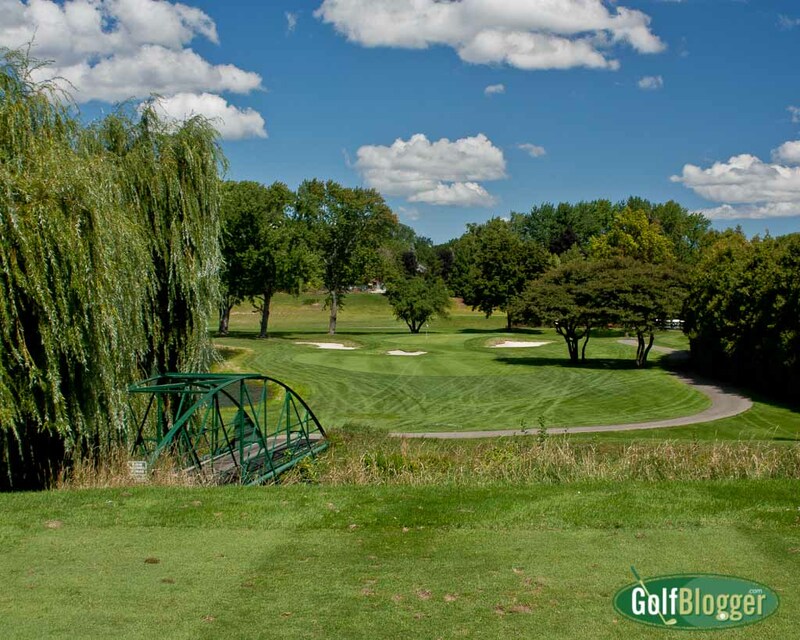 Dating to 1927, the Western Golf and Country Club is a beautiful Donald Ross course located in Redford, Michigan along the banks of the River Rouge. It’s a private club and I’m grateful to board member Pat Hinman and Membership Director Jennifer Coleman for making me a guest for the day. The Rouge is the central, unifying feature of Western. Although at that point in the watershed, the Rouge is little more than a glorified creek, the landscape it has carved comes into play on nearly every hole. Much of the course runs on one bank or the other of the deeply cut flood plain; the rest are located on the heights just above. Following the river, Western is long and narrow; at only one point is it ever more than two fairways wide, and even that is separated by water. The first two holes move upstream, the third crosses the river and then the course turns back. The green of the par five fifth is the furthest the course wanders from the river; the sixth brings you back within sight. And so it goes. The hole designs are what I’ve come to expect from Donald Ross courses in the metro Detroit area: fairly straightforward, with narrow fairways and small greens protected by oft scary bunkering. Changes in elevation from heights to flood plain and back also created some interesting optical illusions. Particularly when playing from the plain upward, holes and flags appeared much closer than they were. As an aside, the course’s design reminds me very much of Rouge Park, another Ross course further down river. In conditioning, however, there’s no comparison. I admit that I was a bit surprised to find excellent course conditions at Western. Over the course of the summer, I’d played several courses located along river flood plains and all had been badly damaged by the spring and summer’s alternating wet and dry conditions. The Donald Ross course at Rouge Park had been hammered by the weather. Michigan State University’s turfgrass center had even sent out a bulletin explaining how the wet weather drove oxygen out of the ground, preventing root development which then killed the grass as temperatures rose. In fact, virtually every course I visited this summer—regardless of geography—had seen better days. There was little of that at Western. The fairways were full; the rough punishing and the greens smooth and slick. It was all the more surprising when I learned that the bulk of the course had been underwater during a spring flood. At one point, a greenskeeper apparently went out in a boat to rescue the flags—only the tops of which were visible. My favorite holes on the course were the par threes. The third is a 190 yard shot from an elevated tee across the Rouge to a slightly elevated and mounded green flanked left by trees and right by a long bunker. The ninth is a 172 yard shot from a high bluff across the Rouge to a tiny green guarded front, left and right by bunkers. Both are particularly picaresque shots. Finally, the twelfth is a 165 yard shot from an elevated tee to a green nearly completely surrounded by bunkers. The elevation on all three make them play shorter, but the size of the greens and bunkers call for precision shots. It is as fine a collection of par threes as I can remember seeing on a course. I had a fun round, made all the more enjoyable with the assist of a caddy. It’s the first time I’ve played with a real caddy and there’s nothing quite like it in golf. In addition to the bag lugging and club cleaning duties, he fed me yardages, gave me aiming points, and offered putting advice—most of which I sadly was generally unable to execute. He was a very nice young man from a local high school (so I won’t mention his name), and made a great course even more enjoyable. A view of the Clubhouse from the 18th fairway, looking across the 10th fairway. 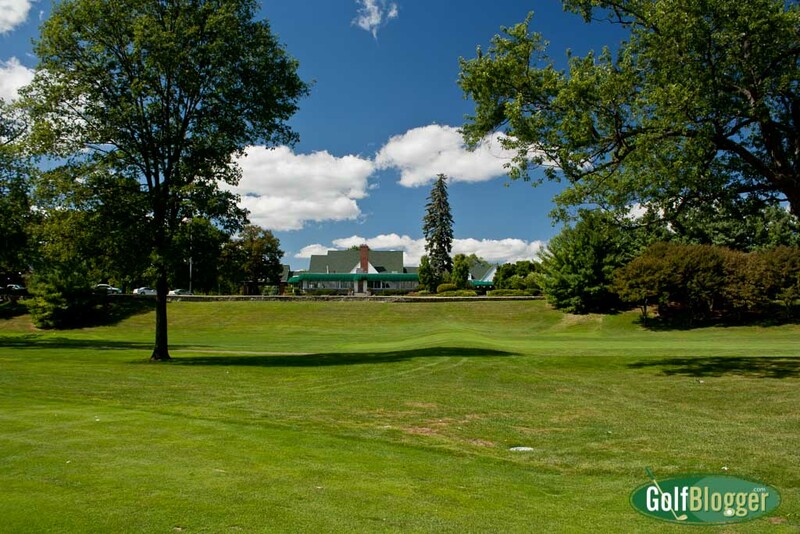 Western’s clubhouse is a sight to behold—a large classic structure that overlooks the tenth and eighteenth fairways, and the ninth green (the only point at the course more than two fairways wide.). The clubhouse dates to 1926, and clearly is appropriate to that era. It has a large main dining room, the “English Room,” Library, Western Grille, a main bar area and a Donald Ross room that just screams “Board of Directors.” The men’s locker room is immense and well appointed. Of great interest to me was the men’s grille.Western has what I am sure is one of the area’s last remaining men’s only bar and grille areas. As you’d expect from a ‘Man Cave,” it’s got big screen televisions, a bar and no-frills seating and tables—all of which were bought with money donated by the gentlemen for just such purposes. How did you determine that Rouge Park is a Ross course? There is no know history of any Ross involvement with the property.